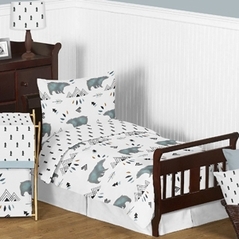 Does boys toddler bedding have to look babyish? Only if you want it to! 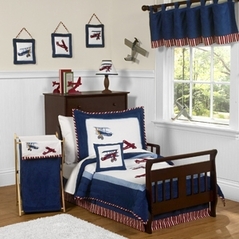 The sky's the limit these days as to what you can do with your toddlers room. 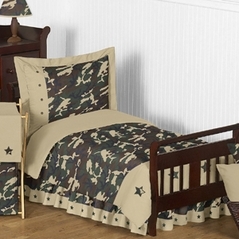 Boy toddler bedding comes in all the traditional colors and themes, such as the color blue, sports, fire trucks, camo bedding and so on. 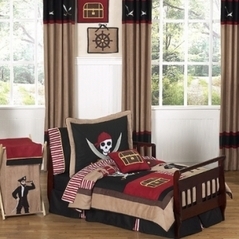 But if you want to be just a little bit different, then look no further for your boys toddler bedding. 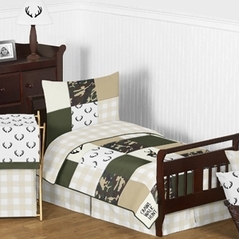 Beyond Bedding offers a great selection of toddler bedding sets for boys, so take a peak! 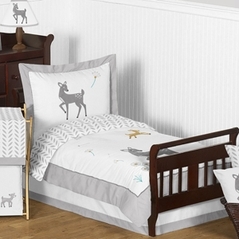 There are endless possibilities when choosing bedding for toddlers, and if you think that's a lot, don't forget to check out the accessories. 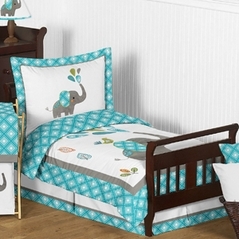 Be sure to also take a look at our teen bedding, perfect for when your little tot isn't so little anymore! 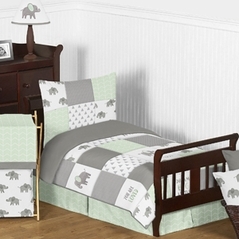 Has your little man reached the age where he too big for his crib, but still not big enough for a standard sized bed? 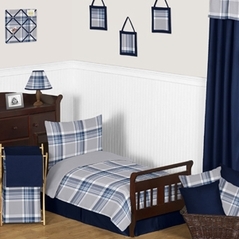 If you are looking to purchase a toddler boys bed, or you are just waiting for the right time to assemble it, you will definitely need a great toddler boy bedding set to complete your little guy�s new bed. Growing out of a crib is a huge step in a child�s life, and sometimes it can be met with resistance. 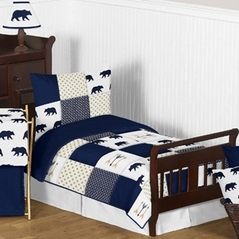 A great way to make your little boy excited about his new bed is to dress it up with a toddler boy bedding set that he loves. 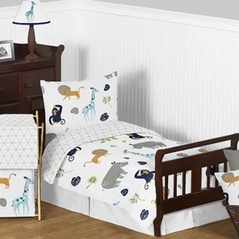 Beyond Bedding offers a great selection of toddler boy bedding, and even better, most of our sets match our most popular crib sets. If you and your little boy have already fallen in love with one of our themes, you don�t have to switch it up just because your boy is growing. A lot goes in to the switch from a baby crib to a toddler boys bed, and we�ve compiled some helpful information to make this exciting step go a lot easier for you and your little boy. Safety is always a number one concern for parents when it comes to their children, so give your child�s room the same consideration you give to other areas of your home. Once your little boy is big enough to climb out of his crib you have to make the switch from his crib to a toddler boy bed. Otherwise, your toddler could seriously injure himself by attempting to climb in and out of his crib on his own. 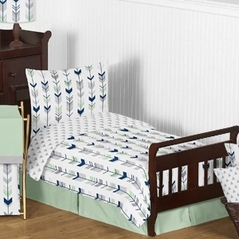 Make sure that you purchase a bed frame and mattress that are compliant with current child safety standards. If you are assembling the bed yourself, make sure to test it out thoroughly before letting your child sleep in his new bed. If you have purchased a metal framed bed for your toddler, routinely check the screws because they can start to jiggle lose after use. 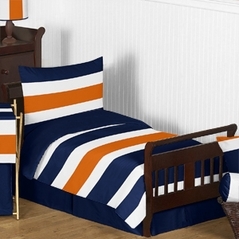 How you position your child�s bed is also important. 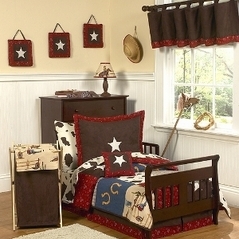 Ideally you should place his toddler bed with the headboard along the wall. You might think that running his bed along a wall will help prevent him from rolling out of bed, but he could accidentally slip in between the wall and the bed. 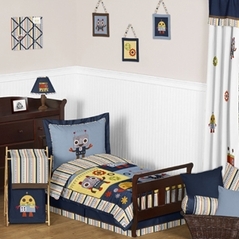 Also look into toddler boy bedding that is hypo-allergenic; dust mites and other allergens can inflame or induce asthma in small children. 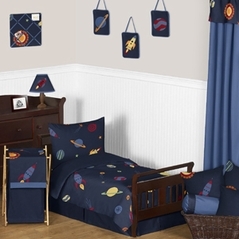 Beyond Bedding�s entire collection of toddler boy bedding is made from non-allergenic fabrics to ensure peaceful nights of sleeping for your little boy. 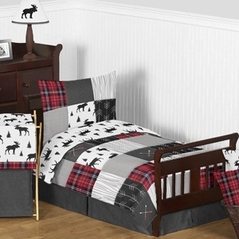 If you don�t know if you want to purchase a toddler boys bed or a regular twin sized bed, the main difference is size and height. 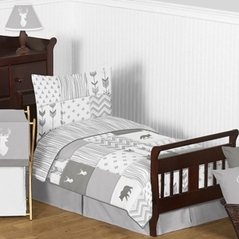 Toddler beds are much lower to the ground and are not as long as a standard twin sized bed. 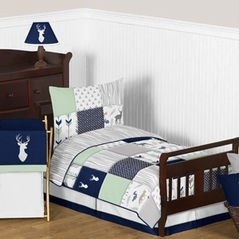 Because of their smaller size, you will have to purchase boys toddler bedding specifically for his new bed. The choice for parents comes down to how big of a transition this will prove for your little boy. If he doesn�t seem ready for a regular sized bed just yet, a toddler bed is a great way to get them out of their crib and into a bed. 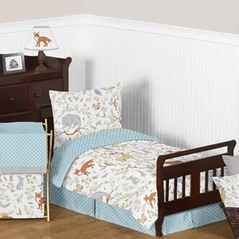 Some children take better to a toddler bed right out of their crib because the small size is less intimidating. As with anything you purchase for your little boy, make sure that the toddler bed frame and mattress meet current safety standards. 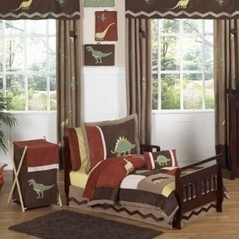 But toddler beds can also provide your child with added safety, because they are less likely to injure themselves falling out of bed in the middle of the night. 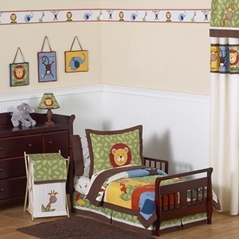 Most toddler beds also come equipped with one or two side safety rails to further ensure your little boy stays snug in his toddler boy bedding at night. 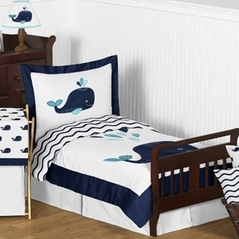 Make sure you don�t purchase boys toddler bedding that is actually meant for a twin sized bed, because it will be much too big! 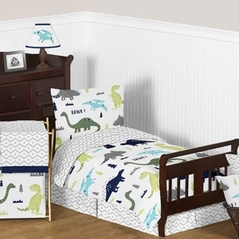 So you have your toddler boy bed all ready to go and now comes the fun part: picking out the toddler boy bedding that you want. Changing from a crib to a bed might not be exciting for your little boy at first, but if you include him in the decision making process, you will probably find that he will get pretty excited about the change. 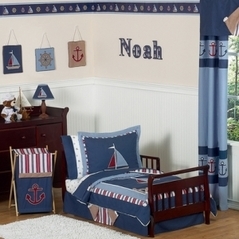 Little boys will jump at the chance to express themselves and pick what they want in their room. 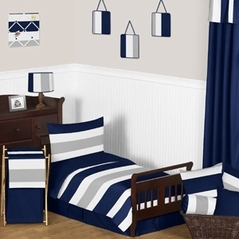 If you include your toddler as you shop for the toddler boy bedding set that will adorn his new bed; you have just gotten him excited about the prospect of change. You will also be encouraging him to develop his own personality by making major choices in his life. 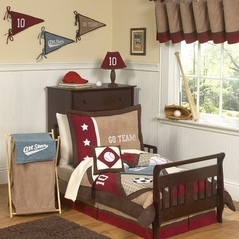 So let your future Big Leaguer show his love of sports with an All Star Sports Toddler Bedding Set or let him indulge his adventurous side with a Jungle Adventure Animal Safari Set full of exotic creatures sure to awaken his imagination. 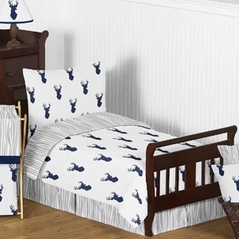 If your little boy is not a fan of change, and wants to hold onto the familiar, Beyond Bedding is the perfect place for you to shop. 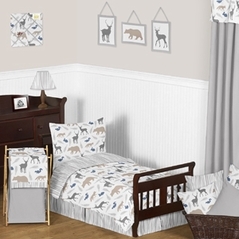 We offer many of our design themes from our baby bedding collections in our toddler boys bedding, so that you can maintain the same bedroom theme even as your child grows. 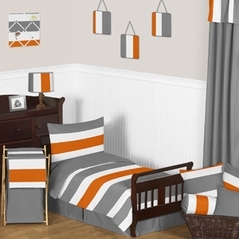 Keeping the same decorating scheme might be especially comforting to a little boy that is uneasy about the switch from his crib into a toddler bed. 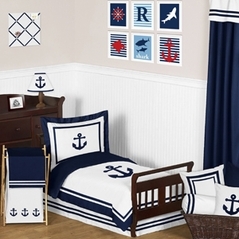 If you still adore the way you set up your little boy�s room, your Come Sail Away Nautical Themed room can easily switch from a baby nursery to a toddler�s room without losing what you love about it. 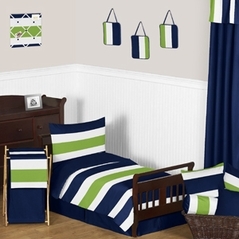 Whether you are looking to change things up or keep an element of familiarity, Beyond Bedding has the right toddler boy bedding set for you and your little boy.